Christina Martinez of New Darlings completes a Laundry Room Refresh with LG Appliances. Utilizing the bedroom master closet, Christina creates an organized laundry oasis with the help of The Home Depot. It feels like we ages ago that we started planning our master bedroom and master closet renovation. We began all the plans last March and the whole renovation took about seven months. One of the biggest things we were excited about was this master closet build out, particularly moving the laundry into the closet for easy access, fast folding, and to save space. We’re excited to partner with The Home Depot on today’s post to share the process and space. When we moved in the laundry was located in its own room off the kitchen and dining room. It was small and got the job done, but due to the awkwardness of the room, it quickly became a dumping ground for everything we didn’t know what to do with. The old washer and dryer units were placed adjacent to one another so the top of them were always full of mounds of clothes, awful I know. When we decided to extended the dining room and knock down the wall that separated the dining room from the laundry room, we thought the master closet would be the best place for the new units. We’ve always been notorious for leaving clothes in the dryer, so we thought putting the washer and dryer in the closet would encourage us to fold and put away clothes faster, while also being able to extend the dining room of course. If you missed our master closet reveal earlier in the week, check it out here. 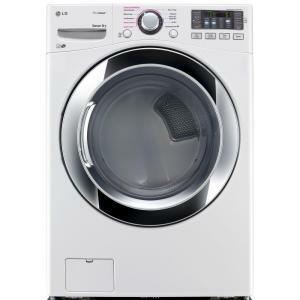 We designed the closet around the laundry area, so it’s only right we highlight the stars of the post first: LG’s High Efficiency Front Load Washer and Electric Dryer. They’re both large capacity units that were easy to stack with the LG Stacking Kit. We were able to schedule an installer with Home Depot, so that when the units were delivered everything was able to be set up on the spot. 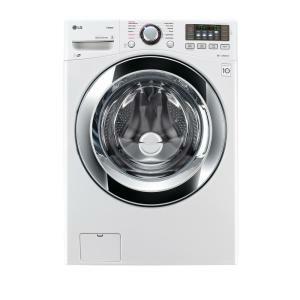 The washer has 12 wash cycles and you can preset your favorites so that throwing in a load of wash is quick and easy. One of the things people warned us about with putting the washer and dryer in our master closet, was the concern about noise, but we have had zero complaints. The washer and dryer have been so quiet there have been a few times I thought I forgot to press start. It’s that good. Making sure we had room for the stacked units but without compromising on storage space was important to us. Having a laundry area to the right with hampers and all the washing essentials stored in baskets for easy access was a no brainer. We wanted to keep things simple and neat. Some of Rob’s sweaters and pants overflow into the laundry area right above the baskets, with his sneakers and boots nearby. Keeping items color coordinated and organized by style has helped to keep everything tidy. To the left of the washer/dryer we had just enough space left for the iron and ironing board. I love that everything has a place and there’s minimal clutter. We added a few more baskets atop to store extra hangers, dryer sheets, etc. The older we get the more excited we get for home gadgets. Once we decided to combine the laundry room and closet, we knew we had to finally try out one of the iRobot vacuums. 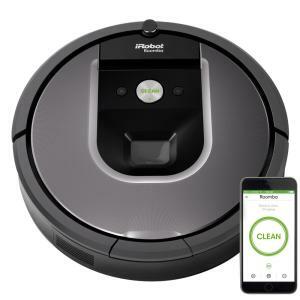 We ordered the Roomba 960 with Wi-Fi and we can’t believe how handy this little gadget has become. It’s small in size so it fits perfectly on it’s docking station under one of the lower shelves and we can control it straight from our phones with the app. It’s been a game changer. Here’s a close up of the pretty light fixture we decided to install in the closet. We knew we wanted a chandelier and thought with the vaulted ceilings that it would really elevate the space, but so many inspiration photos I found for chandeliers in the closet felt very ornate and traditional. It was super exciting when we found this one by Mitzi on The Home Depot website. 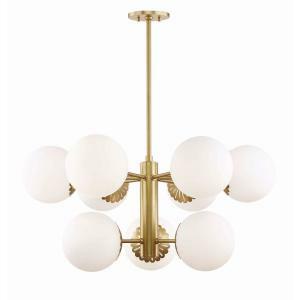 We were immediately sold on the globe lighting style, as it matches the rest of the lights in our home, and I thought the brass scalloped/flower-like detail was so fun. It definitely adds a bit of whimsy to the space and we love it! So what do you guys think? Do any of you have laundry in your closet? Would you try it? Our contractor said that now many new builders are designing their homes with the laundry in the closet to save on space. The convenience of it all can’t be matched!